I am not a homemaker in the spotless house sense. I have never really aspired to be a picture perfect homemaker though I also realize that it goes hand in hand with being a stay at home mom. I’m also not a fan of clutter and fortunately this counteracts and overrides my general dislike of all that homemaking entails. I like to cook, I like to bake, I like to ensure that my home is welcoming. So I suppose I’m a homemaker in that sense. But the cleaning part? No thanks. I’m not a deep cleaner unless the situation absolutely calls for it. Day to day cleaning, I’m fine with that and I think it makes a lot of sense to have a daily cleaning schedule. But what about spring cleaning? Not a huge fan at first, but then I started to see all of the benefits of spring cleaning. 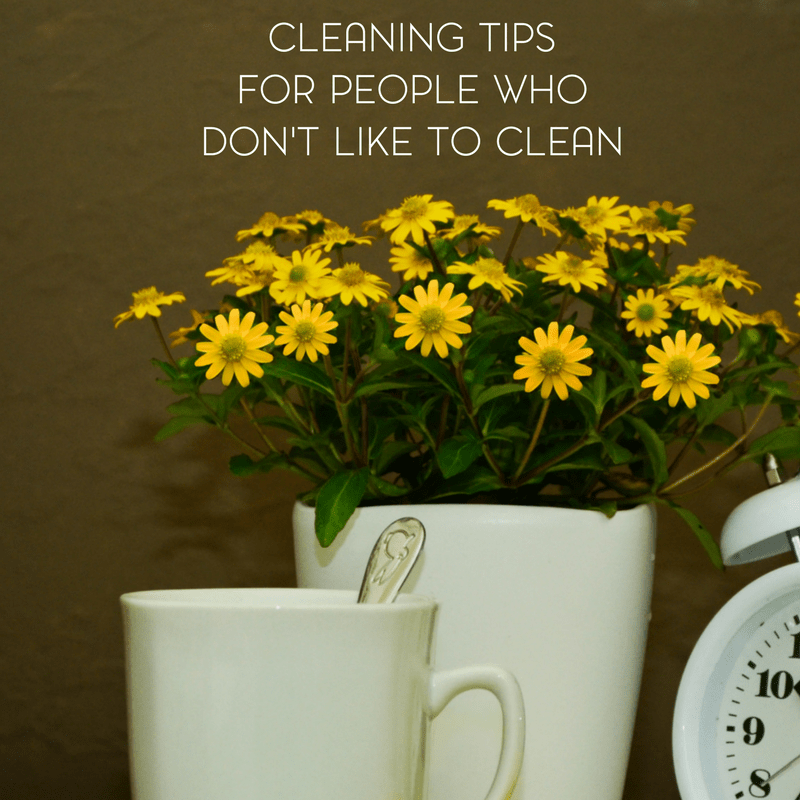 So, I want to share with you some spring cleaning tips and advice for people who don’t like to clean. Or at least who don’t like to deep clean. 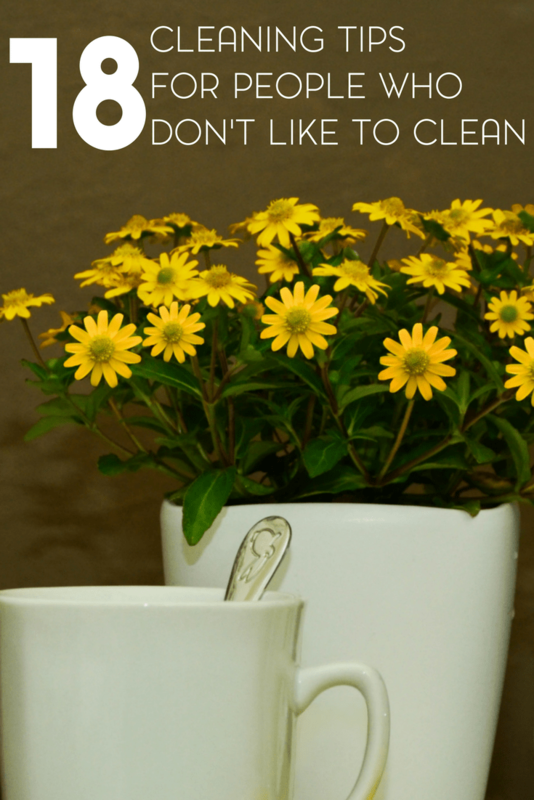 As the weather warms up, many of us begin to feel motivated to do a good spring cleaning in and around our homes. Spring cleaning is an essential part of clearing out the stuffy remnants of winter and making room for the new. 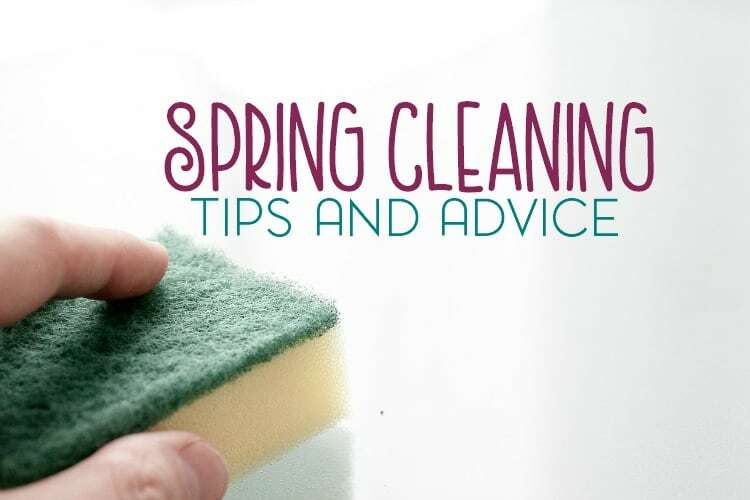 There are a few misconceptions about spring cleaning, and it is important to clear those up before embarking on your mission. Here is spring cleaning in a nutshell… what it is and is not. By the time we are a few months into the year, most of us can use another fresh start. When winter begins to fade into spring, we are ready for a chance to get rid of the old and get on with the new. Spring cleaning gives us that chance to turn over a new leaf, and clean our way into a fresh mindset. Spring cleaning is not just your average weekly chores. Spring cleaning gives us a chance to turn everything over and clear out the cobwebs, literally and figuratively. Spring cleaning is a thorough change from the way we are currently living. It is a chance to get things moving back into the right direction if our standards have slipped at any point. 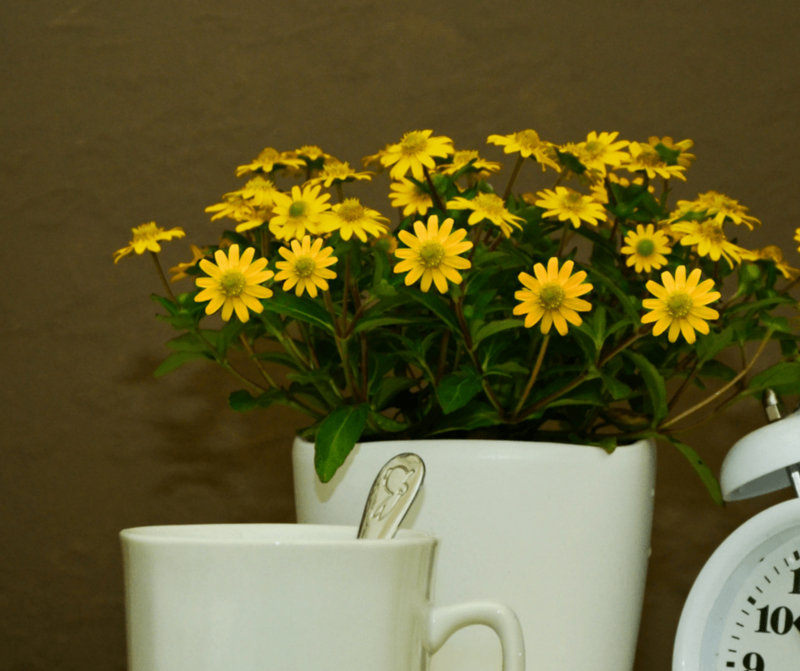 Spring cleaning is not just about wiping away the grease and taking a swish at the dust. It is a great time to make an extensive list to follow, both now and on smaller levels for the future. Find ideas on the internet or in books about home organization. Add to the lists anything that is specific to you and your home so that no stone is left unturned in the process. Once I realized that I could also get a good decluttering groove going, I really started to like spring cleaning more. 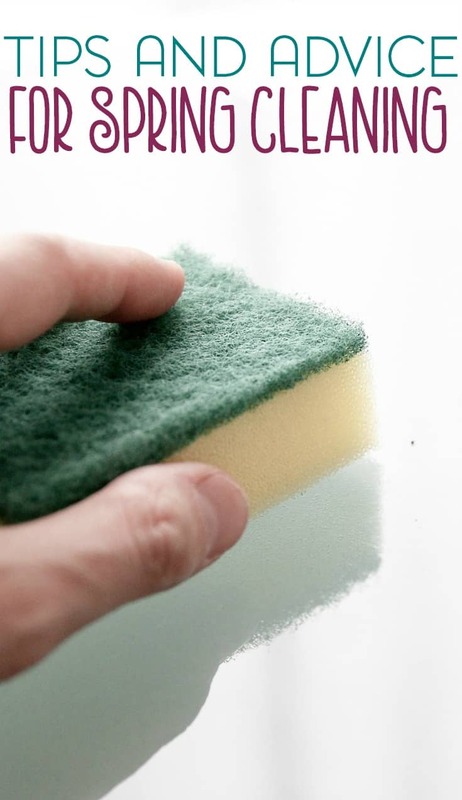 As much as you may want to do as thorough a cleaning as possible, don’t go overboard. Do your best to make your home sparkly and bright, but give yourself a break when necessary. We should strive for clean, functional homes… but they must also be liveable. Do your best, and then relax with the results you acquire. Spring cleaning is generally focused on turning your home into a better, more organized version of its previous state. However, there are plenty other things in your life that you can focus on when you are finished. Spend some of your time spring cleaning your car, and you will once again be able to enjoy your drive to and from work every day. Extend spring cleaning to your purse, and you will be able to find what you need more quickly when you are away from home. Spring cleaning has many benefits and is something every individual should embark on. It is a great time to make your home feel like a brand new place, but your spring cleaning endeavors can extend to whatever part of your life you choose. Go through a mental checklist of every area in your life that needs some overhauling, and find ways to make those changes. With a little bit of organization and a lot of effort, you will have a beautiful home and surrounding area to enjoy once again. Spring cleaning is a great idea for anyone who lives in their own home. Whether you have a large or small space, every dwelling needs a good thorough cleaning on a regular basis. Spring cleaning brings many benefits, and here is a list of the important ones. Having a clean home is a great feeling. A cluttered, messy environment can wreak havoc on one’s emotions. Being able to come home every day to a space that is tidy and organized is a great gift you can give to yourself. It is a depressing feeling to wake up to disorder every single morning. Many people can attest to the fact that living in an untidy environment brings you a great amount of unnecessary stress. Spring cleaning will ensure that your home feels peaceful, rather than the chaos that you may have been forced to become used to. No one wants to invite their friends over to a home that appears uncared for. It is embarrassing when your home is in disarray, and someone calls out of the blue and asks to drop by. When your home has been through a detailed spring cleaning, you will feel proud about the way it appears. Inviting guests over will be a pleasure for you, and for them as well. Time is yet another benefit of spring cleaning. When you have to dig through a pile of clothing to find a small piece you have misplaced, or search yet again for the keys or shoes you lose on a consistent basis, valuable time is being lost. Spring cleaning saves time, as it give you a change to reorganize. It allows you to sort through everything you own once again, and give each tiny item a place of its own in order to be easily found each and every time. To be organized is a great feeling. When you are organized, life runs more smoothly. If your home is orderly, both you and your guests will feel the difference. It will be easier to go about your daily duties, and keep on top of everything you are responsible for. Spring cleaning is a great workout. It may be surprising to some, but both light and heavy housework give your body a boost. You may be surprised at what a sweat you work up while getting your home into tip-top shape. You can be sure to move your muscles, stimulate your lymphatic system, and even get a bit of cardio in while organizing items and scrubbing walls. You can also make your own cleaning products. One of spring cleaning’s outcomes is finding things that we realize we do not need. This is a great time to give away what we cannot use anymore to someone who can benefit from our unwanted items. When you have sorted through clothing that no longer fits, appliances you no longer use, and books that your children have outgrown, you have a choice what you will do with it all. Consider donating to a charity or someone in need. The feeling of satisfaction will be worth all the time and effort you put into it. There are many benefits of spring cleaning, and these are just a few. Consider all the bonuses that this yearly ritual will bring you. Keep yourself going through the hard work with the thoughts of everything you will gain. Most professionals have at least a variant of this particular rule, which says that if you have not used an item for at least one year, you probably shouldn’t keep it. There are exceptions to this rule, but it is a good general idea. When deciding whether to keep or toss an item, think about when you last used it, and if it has been too long, it is likely useless and taking up valuable space. This is a basic rule that is always wise. When spring cleaning, begin cleaning at the top of each room and continue on toward the bottom. For example, begin with washing walls, then cleaning furniture and tables, and finally give the floor a thorough cleaning. Most particles generally fall downwards, and this secret ensures that you will not clean the floor, only to have dust and other junk fall from furniture as you move to the next step. When you are going through anything from old clothing to extra clutter, keep this simple rule in mind: keep, donate, or trash. Always divide the items into three piles as you sort them. Keep the items you love, donate the items that are in good condition but someone else can put to better use, and trash anything with damage. This makes every pile easier to deal with and to organize. Even the most ambitious and organized professional will tell you that it is almost always easier to get a job done with a little help. If possible, include family members by giving everyone their own personalized “to do” list. If you are not getting enough cooperation from immediate family members, or you live alone, consider doing a cleaning swap with friends, or give thought to hiring a professional. One tried and true method for making spring cleaning easier to handle is by working in segments in your home. If you attempt to tackle everything at once, you will soon be overwhelmed. Move through your home room by room, and corner by corner. In no time at all, you will have completed your entire list. Any professional will gladly remind you that the fewer items you have, the less you will have to clean and organize later on. As mentioned before – when you are going through your home during spring cleaning, think about what you can live without. Get rid of unnecessary items whenever possible. Spring cleaning, even if the very thought may make you roll your eyes or sigh in disgust, is actually a wonderful thing. And this is coming from someone who’s not really a fan of homemaking or cleaning.